Why Replace Teeth With Dental Implants If I Can’t See Them? Dentists often note that molars are some of the most vulnerable teeth in the entire mouth. Molars undergo a lot of pressure throughout the day, grinding and chewing some of the toughest foods we consume. They’re truly an essential part of our digestion since they prevent us from swallowing food that’s too large to break down properly. However, many people still don’t understand the point of replacing back teeth with dental implants if they aren’t even visible. Today, we’ll break down exactly why it matters. As mentioned, back teeth play a large role in chewing, which is reason enough to get them replaced. But replacing back teeth isn’t only meant to restore your chewing abilities. It also works to prevent neighboring teeth from shifting into the empty space left behind. Furthermore, teeth that would otherwise stay in place will begin to over erupt, exposing the vulnerable roots underneath. 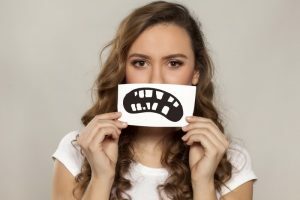 As these teeth continue to shift, the alveolar bone, which is largely responsible for creating a stable foundation for your teeth, begins to diminish. Your jaw bone will also begin the process of resorption, which is essentially the body’s response to unused bone. As bone drifts away from your jaw, your biting force as a whole begins to weaken. It’s not just your ability to grind food that diminishes with missing back teeth, but your ability to chew overall. An uneven bite increases the likelihood of neighboring teeth rubbing up against each other. This leads to enamel erosion and eventually increased tooth sensitivity as a result. Since the loss of enamel is permanent, this is a very serious condition you’ll want to get treated. When the bite is uneven, the force that’s applied while chewing is uneven, therefore putting additional stress on your temporomandibular joint. This joint is responsible for the complex movements your jaw makes. After enough time, you may start experiencing the symptoms of TMD, or temporomandibular joint disorder. These include chronic jaw, ear and upper back pain, headaches, popping and clicking of the jaw, and generally a lower quality of life. Finally, teeth that shift and erupt more than intended can also rotate, making them more crooked. If appearance is a high priority when it comes to your smile, not replacing teeth will put neighboring teeth at risk of looking less attractive as they continue to move. Thankfully, tooth replacement options like dental implants can prevent these consequences. Schedule an appointment with an implant dentist to see which options are right for you! Dr. Megan A. Shelton earned her DMD degree from the University of Louisville School of Dentistry. She continues her education annually in order to stay on the cutting edge of the latest tooth replacement techniques and technologies available in dentistry. To learn more about her practice, you can contact her through her website. Comments Off on Why Replace Teeth With Dental Implants If I Can’t See Them?